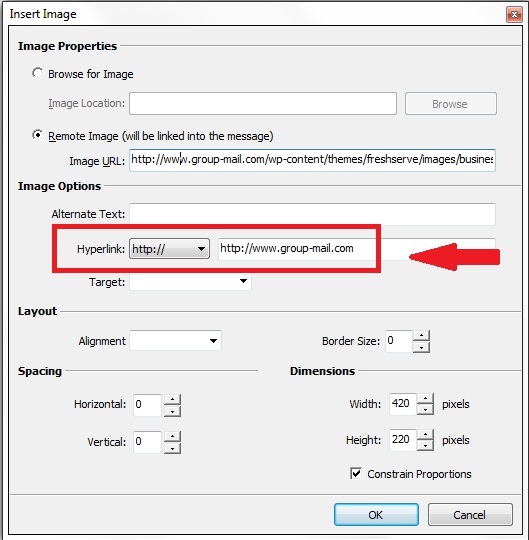 In the Message Editor in GroupMail, right-click on the Image that you have inserted into your Message then go Image Properties. Next enter the URL that you want this Hyperlink to go to. In this example I have entered //group-mail.com (you need to enter the URL that you wish to open when someone clicks on this image here please). * When your message is received and someone clicks on this Image it will bring them to the URL that you have entered above. ** It’s a good idea to get in the habit of adding some alternate text to images as well. This way, if an email client blocks an image for some reason, the descriptive text for the image will still show in the message. Another method of doing this is via the Insert Menu on the Message Editor, Hyperlink Menu option and then following the same steps.